Keep food hot or cold for hours with the Thermos Stainless Steel Vacuum Insulated 47 Ounce Food Jar. This 47-oz container features 2 inner containers, a durable stainless steel interior and exterior, making it ideal for outdoor activities, sporting events, picnics or lunches. 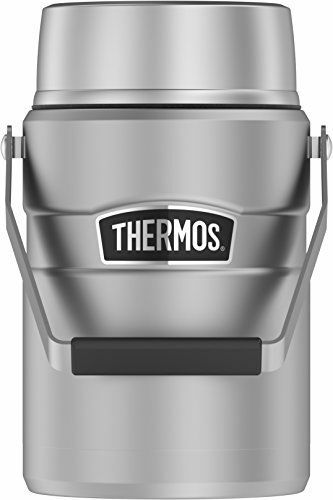 As with all Thermos vessels, this container uses vacuum insulation technology for maximum temperature retention that is ideal for soups and other hot foods. Itâs very useful and hold a lot!!! Itâs very useful.my father got sick recently, and he needs stay in the hospital for couple months. The container can hold a lot of food and keep them warm enough for Lunch and dinner. I will Highly recommend to other!!! Check all pieces, I give 4.5 stars ordered the item, arrived without the top seal to help with leaks and keep food hot (i had bought a previous product). the two plastic containers stain depending on sauces, and when piping hot water is placed in the containers, there is a small deformation that occurs, then taking it out becomes difficult, not impossible.For me, this product works well, i work in 30 to 50 F weather from 7 am up to 5 pm its still warm, midday its hot.